1. MAC Ruby Woo $16 A true powdery vintage red. Be sure to exfoliate lips and use lip balm prior to use. This is the color I reach for when I want to channel a true bombshell look. 2. MAC Russian Red $16 Slightly more blue toned and less matte than Ruby Woo. Still this shade is vibrant and pairs well with just a hint of bronzer. 3. L'Oreal Collection Exclusive Blake's Red $8.99 My newest addition to my red lipstick collection. This is my favorite shade of the Collection Exclusive in Red Tones. I tend to lean towards more blue tones reds that orange toned ones and this one does not disappoint. 4. L'Oreal Redefined Ruby $9.99 This is my all time everyday red. It is deeper, more berry, and blue. This is the lipstick that I receive the most compliments on. 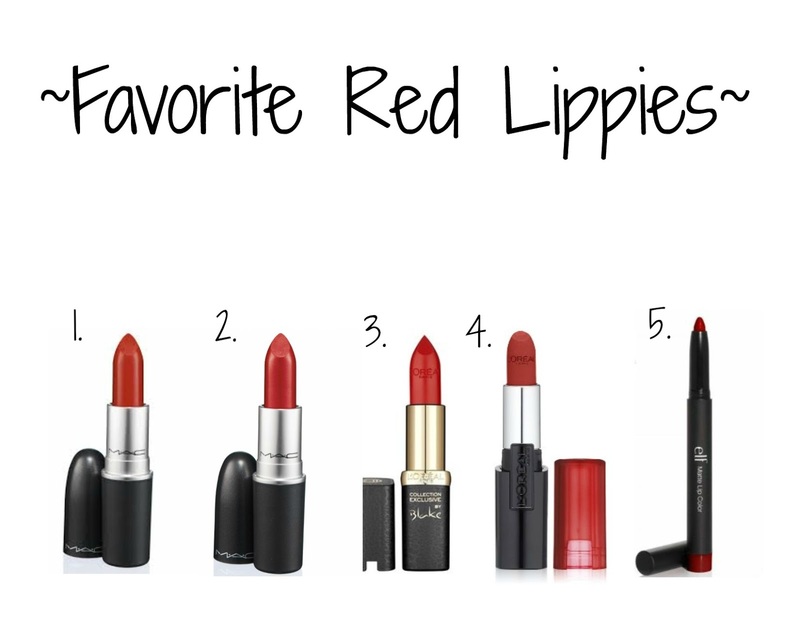 If I ever had to choose one red lipstick, it would be this one hands down. It glides on well and has a lovely sheen to it. 5. e.l.f. Matte Lip Color Rich Red $3.00 While this line is matte, it is not overly matte. It still feels smooth on the lips and lasts a very long time. Bonus points for the tiny sharpener embedded in the end of the stick.